KAZUKI’S, Daylesford: If there’s one restaurant you should go to, it’s this one. Not currently included on the Top 100 list, but it certainly should be! It’s ridiculously good. Blending modern Australian and Japanese, this food is different, beautiful and delicious. The decor is relatively simple with colourful paper light fittings and the place has got a great vibe. To kick off, we were absolutely blown away by the squid ink, plum sake and nori butter that was served with our bread. So good that you can buy it to take away. This set the tone for the rest of the meal. 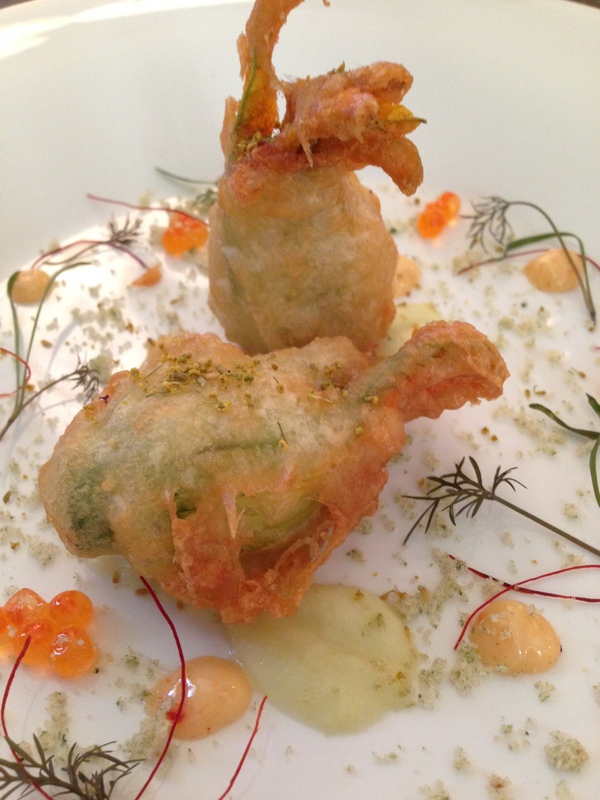 The spanner crab zucchini flower dish was a great start to the meal. Golden and crispy batter combined with the sweet crab meat. I also couldn’t go past the Moreton Bay bug dumplings with sake emulsion. As great as these dishes were, it was the main course that was the outstanding one! Snapper, scampi, squid ink lasagnette, Jamon, sauce American. This is certainly had WOW factor. As we tucked in we were in raptures! The snapper skin was wonderfully crispy, the pasta was soft and silky, the jamon was just the right level of subtle saltiness and the sauce… OMG! Perfection! I was also excited to see Curly Flat Pinot Noir available by the glass. I had only had this once before at Guillaume at Bennelong, and I enjoyed it so much it has always stuck in my mind. This glass didn’t disappoint! To top it off, the service was spot on and it was great to have such enthusiastic and knowledgeable staff. You have to get to Kazuki’s and experience this amazing food. So good we tried to get in again the following night but alas, it was booked out! Definitely worth the drive from Melbourne – or from anywhere for that matter! Snapper, scampi, squid ink lasagnette, jamon, sauce American – outstanding dish!!! !